The problem is that if that first value happens to be a NULL, there is no easy, built-in way to skip it. While a UserVoice item exists to add the ability to ignore nulls (go vote! ), today, we’re going accomplish that end result with some alternative queries. We’ve got a an integer identity column, two groups of rows, and NULLs that are sprinkled into otherwise unsuspecting integer values. 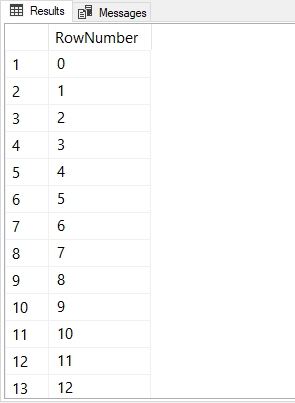 Let’s look at two queries that will help us get the number 6 into that FirstValue1 column for the second group. 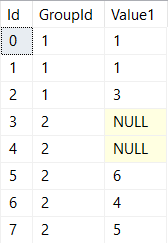 By filtering out NULLs in our derived table query, FIRST_VALUE returns the first non-null value like we want. We then join that back to the original data and all is right again. Both of the above queries produce the same output – which one should you use in your production code? Well, the “Derived FIRST_VALUE” query has a lower relative cost than the “Triple Join” query, maybe it’s better? This isn’t a real-world execution plan though – surely we never scan heaps our production environments. Okay, a closer match up but the “Derived FIRST_VALUE” query still appears to have a slight edge. With only 8 rows of data, our “Derived FIRST_VALUE” query sure is performing a lot of reads. What if we increase the size of our sample dataset? WOW that’s a lot of reads in the “Derived FIRST_VALUE” query. Both of the above queries will return the first value without NULLs. But they probably won’t perform exactly the same as they did on my examples above. Copy the above code for sure – but test it out. See what works better on your specific server configuration, data size, and indexes. Maybe both queries are terrible and you need a third, better way of doing it (if you write one, let me know!) – but please, please, please, always test your code. Last week I needed to write a recursive common table expression. I’ve written them before, but it’s been a while and needed to visit the documentation to reference the syntax. “Multiple…recursive members can be defined” – what???? I never knew you could have multiple recursive member statements in a CTE. Heck, I didn’t even know what having multiple recursive members could do. Since the documentation doesn’t talk about them beyond the one highlighted line above, I decided to create some examples to see if I could get them to work. 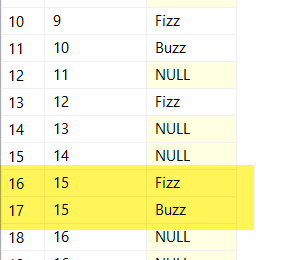 FizzBuzz is a programming puzzle that asks the solver to write a program that will list the numbers 1 to 100, displaying the word “Fizz” for any numbers that are a multiple of 3, “Buzz” for any multiples of 5, and “FizzBuzz” for any multiples of 3 and 5. I decided to try and implement the FizzBuzz problem as both a single and multiple member CTE to see how the solutions would differ. The first SELECT statement in the CTE definition is known as the “anchor” member. 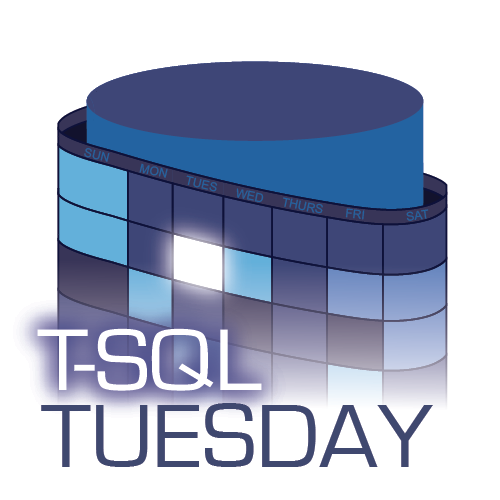 This query runs a single time and acts as the initial result that the recursive query acts on. The second SELECT statement in the CTE definition is known as the “recursive” member. This statement executes on the results of the previous execution (or on the results of the anchor member for the first iteration). The recursive member will execute over and over again as long as it is still producing results. Since our recursive statement is just adding 1 to the previous result, our recursive query would run forever – which is why we add the WHERE condition stop it from executing once we reach 100. First, we add a second column to our results to display the word “Fizz”, “Buzz”, or “FuzzBuzz”. In the anchor member, we defaulted this value to “FizzBuzz”. In our recursive member, we added a CASE statement to display the correct word. The modulo operator (%) checks to see if the current row divided by 3, 5, or 15 results in a remainder – if the remainder is 0 then we know we found a multiple of that number. You’ll notice we have 3 recursive members: the first generates all rows up to 100 that are not multiples of 3 or 5, the second generates all rows that are multiples of 3, and the third statement generates all rows that are multiple of 5. The way I decided to fix that is by adding a STRING_AGG() function to the final SELECT statement, concatenating the outputs of rows with the same RowNumber. With that addition, our multiple recursive member CTE FizzBuzz solution is complete. One thing to be aware of in the above solution: each of the recursive member statements will execute on the previous results of ANY recursive member statement, so we add the conditions “…and FizzOrBuzz in …” to force each recursive statement to run only on the output from its own previous result. This feels like cheating a little bit, but it was the only way I could solve the problem I had defined. I had a hard time coming up with a practical uses for multiple recursive member CTEs. I searched online for some examples but it doesn’t seem like many people have written about the topic. One exception I did find was an article by Itzik Ben-Gan where he uses them to solve Lord of the Rings family trees (heh). Honestly though, as excited as I was initially to learn that doing this is possible, I don’t know if/when I’ll ever use it. I’m hoping I encounter a problem one day that can make use of multiple recursive statements, but who knows if that will ever happen. If you have used multiple recursive member CTEs to solve a real-world problem before, leave me a comment – I’d love to hear about the scenario you used it in.